This beef curry recipe is a mild version of the famous beef curry and has vegetables like potatoes and carrots. There are many version of beef curry and some don’t use vegetables, just pure beef. And with regards to creaming the stew, some beef curry versions use cow’s milk instead of coconut milk because there are people who can’t tolerate coconut milk. But compared to milk, coconut milk makes the curry dish more flavorful, creamy, rich and tasty. 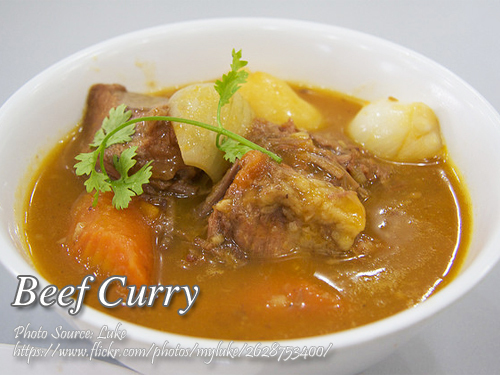 To cook beef curry; In a medium size wok, heat cooking oil and fry potatoes and carrots until color turns light brown. Drain and set aside. In the same wok, saute garlic until fragrant. Add onion and saute until soft. Add in beef briskets and stir fry until the color turns to brown. Dissolve curry powder and hot water. Pour fish sauce, curry powder and 1 1/2 cup water then simmer meat for 40 minutes or until meat is tender. Add more water if necessary. Add in fried potatoes, carrots and bell peppers and simmer for a minute. Pour in coconut milk, salt and ground pepper then simmer for another 4 to 6 minutes or until the liquid is slightly thick. Keep stirring to prevent sticking on the bottom of the wok. Turn off heat and serve hot. In a medium size wok, heat cooking oil and fry potatoes and carrots until color turns light brown. Drain and set aside. In the same wok, saute garlic until fragrant. Add onion and saute until soft. Add in beef briskets and stir fry until the color turns to brown. Dissolve curry powder and hot water. Pour fish sauce, curry powder and 1½ cup water then simmer meat for 40 minutes or until meat is tender. Add more water if necessary. Add in fried potatoes, carrots and bell peppers and simmer for a minute. Pour in coconut milk, salt and ground pepper then simmer for another 4 to 6 minutes or until the liquid is slightly thick. Keep stirring to prevent sticking on the bottom of the wok. Hi Zussie, thanks for your comment!